Welcome to Jeff Wilkins Fly Fishing . ….My name is Jeff Wilkins, and I thank you for wanting to discover more about what I do here. Fishing and I go way back, back to the days of being a young boy. As a young boy, I have my first memories of fishing with my father. It is he who took me fishing first. Little did I know then that a 10 inch rainbow would kindle a fire of passion, one that has always burned and still burns passionately today. Thank you Dad for introducing me to fishing. My dad was a great man in many ways and taking me fishing a lot was just one of them. He passed away and was promoted to heaven in June 2011 and because he was a believer in Jesus Christ I will see Dad again one day……thank you God for that. Fishing has been something I have enjoyed for over 40 years now. In addition, I have enjoyed flyfishing for the past 31 years. You may ask “us?” When you pursue a passion in the fly fishing industry, or any outdoor industry for that matter, it takes the unwavering support of a whole lot of folks to make things work. 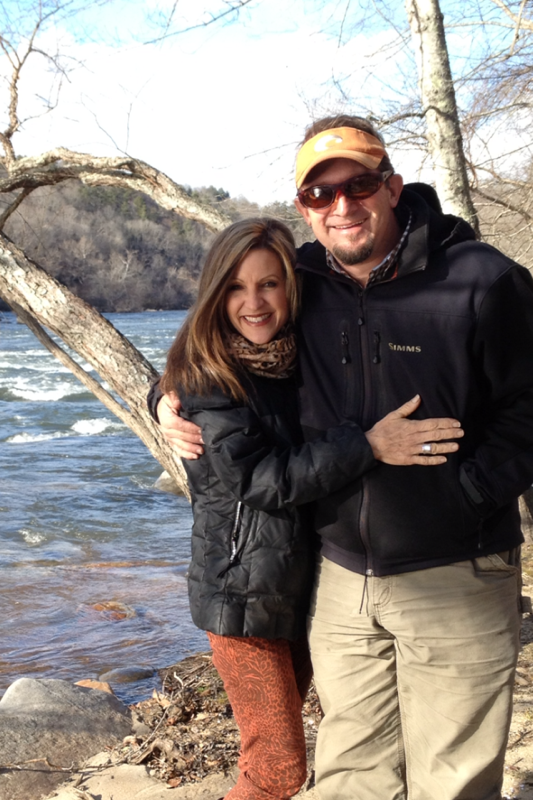 I am blessed to have a son and a wife who also love the outdoors, and it is a part of our lives in a very special way. Its one of our favorite places and ways to spend our free time. My wife Kathy and I …..in other words, she’s the catch of my life….as well as being the brains and wisdom of this gig. We actually met through flyfishing…. Kathy had a friend who was a customer of mine, and she introduced Kathy to fly fishing, then introduced Kathy to me. It all worked out…and fortunately she didn’t throw me back…. Our youngest son Josh, 24, lived in Greensboro, Asheville, then McCleansville, NC….a very talented young man and incredible with a fly rod……occasionally he let me catch one here and there… Josh, a good fly tier, used to help me with fly orders with his tying skills. An avid deer and turkey hunter, Josh spent a lot of time in the outdoors. Also an incredible golfer who could have played collegiately and maybe professionally some day….just incredible. We lost Josh tragically in October 2017 and continue to work through the loss. Not a day goes by he isn’t at the front of my mind and thoughts. Our oldest son Ben, 26, an incredible fly tier and angler….he lives in Wilmington, NC and manages and guides for Intracoastal Angler Store and Fly Shop there….. Ben has helped me with guiding some trips. Ben is the best fly caster I have ever known…..even compared to some of the famous guys I have rubbed shoulders with over the years. Yes, even them. Also an avid hunter, just as at home in the woods , wading in a stream, or in a boat inshore and offshore. I’ll go a step further and say Ben is the best all around angler I have ever known….be it a fly rod, a spinning rod, a baitcaster…..he can do it all and do it all well. We were truly blessed to have two boys who love the outdoors, whether with a rod in hand or a shotgun in the woods….of course having two ponds here and a vast expanse of countryside, woods, and a creek/stream on the property it really helps that develop. We fished, hunted, and camped a lot when they were growing up, but perhaps the greatest joy for me is that they possess their own passion and love for fishing……fly fishing….that I tried to encourage but that I allowed them to develop uniquely and entirely their own. That they love it means a lot to me with what I do for a living. To watch them lay out incredible loops, manage line, and nail a fish…..there’s no way to describe it……. To watch them cast…..is incredible. I’m not only impressed……but perhaps the right word would be stunned. Throwing 90 to 100 foot casts with a near perfect loop….as I said I was stunned. Well done my sons! Without the support or encouragement of my wife Kathy, my sons Ben, and Josh, my dad who has already gone to be with the Lord, my mom Dot who has already gone to be with the Lord, and stepdad Erv, my mom and dad #2 Dale and Howard Wallace, and all the rest of our families—and most of all the Lord Jesus Christ who is my daily strength—-and who saved my life 20 years ago through His Gospel ……thank you Lord and Praise to your Name!! !—–without you I could do nothing. I am looking forward to spending Eternity with you. I thank you for all the wonderful customers I have been blessed with and for this wonderful place that you created and the birds and wild game that give us feathers with which to tie flies to catch the wonderful fish you created. As your word declares, you are more Majestic that mountains rich with game (Psalm 76:4). May every visitor to this place know you and your wonderful Grace that provides a way for messed people like me to have an eternal home in heaven. I have been told and I am sure its been said that you shouldn’t mix your beliefs with business and sometimes you will offend people…..but friends to be quite honest with you all that I have, all I will ever do, all I will ever be wouldn’t be possible if it weren’t for Jesus Christ. I am a Federation of Fly Fishers Certified Fly Casting Instructor, and teach the fly fishing and fly tying curriculums at both the University of North Carolina Greensboro and Guilford Technical Community College. Both schools for the past twelve years have offered a great medium in which to share skills with others. In over 3 decades now I have taught hundreds of people to cast a fly rod, and today it remains one of the most enjoyable things I do. When not on the water, I enjoy camping, fishing with family and friends, tying flies, hunting, shooting, landscaping and working outdoors, and spending time at home with my family, which includes my wife Kathy, our three dogs Penny, Boone,and Lucky – – -we have too many animals! Thanks for visiting us on the web…. !